Truck-side advertising isn’t a new concept. For a long time, one of the most intelligent marketing decisions a company could make was to wrap their trailer fleet and brand themselves with every mile driven. As with all good ideas, someone challenged the concept and made it better. Wrapped trucks are nice, but are an expensive, time-consuming, long-term solution. Someone challenged the status quo. Why couldn’t the sides of a company fleet change like a billboard? Was it possible to change the message in an easy, cost efficient manner? Billboard companies rotate their clients’ messages every four weeks and are tied into the overall marketing campaign. Why can’t fleet advertising be treated in the same manner? 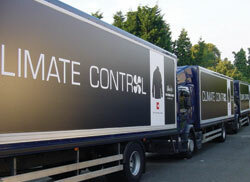 Advertising Trucks introduces the Traxx system, the world’s most popular truck framing system. A Traxx Framing System allows you to change your message as quickly, easily, and cost effective as changing a radio or TV spot. In fact, Advertising Trucks will develop a plan with your marketing and distribution departments to regularly change your messages and keep your marketing fresh. After all, for every 100 trucks you have on the road, you’re delivering over 6 million daily impressions. You might as well be delivering your most current message. You get the idea. Don’t be handcuffed to a branding message for the next 7 years. Utilize your fleet to help sell within the framework of your current marketing platform. If you want to Get a Quote for Traxx Framing System you can Contact Us at anytime.